Som ett komplement till mina tidigare inlägg bl.a. 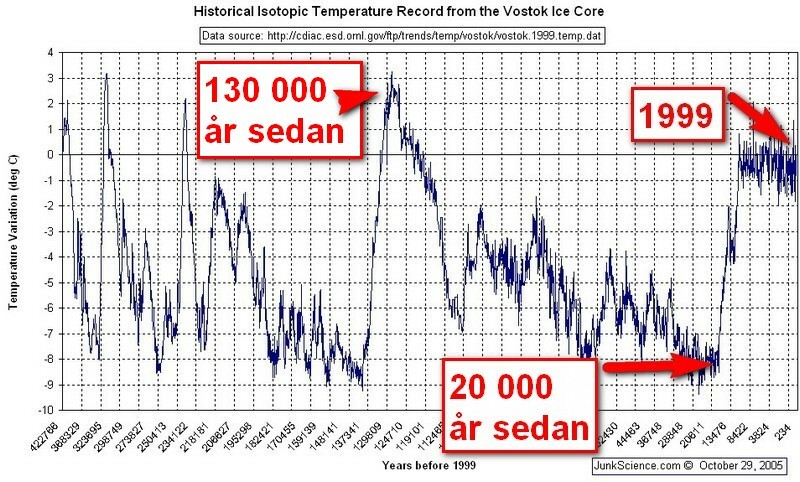 : 422 700 år av temperaturdata från Antarktis, Temperaturen för 130 000 år sedan och Temperature data – What it really means., som handlade om Vostok Ice Core temperatur data. Kommer här en mera detaljerad genomgång av Vostok datat uppsplittrat på 50 000 års intervaller. Se även: GLOBAL TEMPERATURE TRENDS FROM 2500 B.C. TO 2008 A.D., Global Warming: Has the Climate Sensitivity Holy Grail Been Found?, This is what the Global Warming Hysteria is all about – 0,03%!, A Climate of Belief – The Story of Climate models!, Study of Greenland Ice Finds Rapid Change in Past Climate, NOAA Cherry Picking on Trend Analyses, The Spatial Pattern and Mechanisms of Heat-Content Change in the North Atlantic, Ytvattentemperaturen i Atlanten utanför Central Amerika de senaste 32 000 åren., Assessment of the reliability of climate predictions based on comparisons with historical time series, Cold in the tropical troposphere but it should be warming if Global Warming ”theories” are correct!, Average Day By Day Variations Of The Global And Hemispheric Average Lower Tropospheric Temperatures, 2 miljarder år av temperaturdata!, Rewriting Temperature History – Time and Time Again!, Has the IPCC inflated the feedback factor?, Outstanding Job That Anthony Watts Has Done On Documenting The Immediate Environment Of Suface Temperature Monitoring Sites, The wonderful benefits of CO2!, När CO2 var som störst var temperaturen som lägst! Observera att det är bara några få procent under dessa 422 700 år som temperatur variationen har legat ÖVER 0 grader. NOTE 3: The graph which illustrates the lag the best, and also has the most carbon data is 150,000-100,000 years ago. The bottom line is that rising temperatures cause carbon levels to rise. Carbon may still influence temperatures, but these ice cores are fairly neutral on that. If both factors caused each other to rise, positive feedback would become exponential fast. We’d see a runaway greenhouse effect. It hasn’t happened. Some other factor is more important than carbon dioxide. If this whoping trend continues, I have to notify IPCC and Al Gore of this, as yet, unreported BIG shift in the opinion. This entry was posted on 29 oktober, 2008 at 1:30 f m and is filed under Miljö - Environment. You can follow any responses to this entry through the RSS 2.0 feed. You can leave a response, or trackback from your own site.